Chaetognaths, whose name means “bristle-jaw,” can be found all over world, swimming in brackish estuaries, tropical seas and above the deep dark ocean floor. Also known as arrow worms, the creatures have been around since the Cambrian Period, but their precise place in evolutionary history has long eluded scientists. Now, researchers at the Okinawa Institute of Science and Technology Graduate University (OIST) have learned where arrow worms wiggle on the Tree of Life, and their results could reveal important trends in the evolution of bilateral organisms. The researchers sought to verify the relationship of the predatory arrow worm to other spiralia — members of a diverse group of organisms, or clade, believed to share a common ancestor. The spiralian clade includes mollusks, segmented worms and flatworms. Strikingly, the scientists found that arrow worms don’t belong with spiralians, but instead with a new group of animals that form a sister group to the clade. The results, published January 10, 2019 in Current Biology, challenge the classical view that complex organisms evolved from simple ancestors by gaining new traits over time. 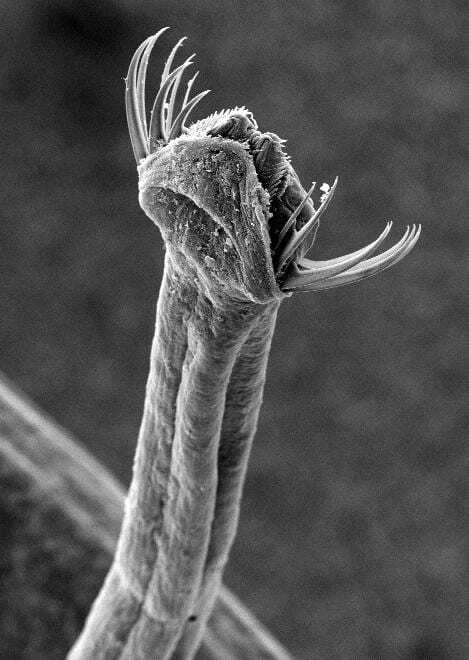 Though very different in appearance, arrow worms and their phylogenetic relatives, such as the microscopic animals known as rotifers, seem to share a unique jaw structure. Composed of dense protein matrix and a fibrous substance called chitin, these jaws are situated near the organisms’ mouths and allow them to grasp their prey. Looking forward, Marlétaz hopes there will be more morphological studies of arrow worms, to connect the dots between the animals’ phylogeny and their physical characteristics. For instance, the researchers don’t yet know what genes give rise to the iconic “bristle jaw” of the Gnathifera clade, or what other specific feature might unite the group.